What a sweet delicate image with the two birds amongst a bunch of flowers. I decided to keep this card simple as to not take away from the gorgeous image. I mounted the Vintage Journal Card on some blue Cardstock and raised on foam dots . My base is from the Card Makers papers and adds a elegant touch. 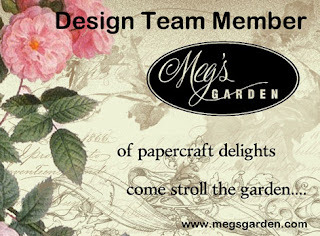 Card making is made so simple with the beautiful products from Megs Store. I encourage to pop over to the shop and see all the lovely goodies.